FJS hosted another event continuing their series of J-Talks on 04 November in E-025. 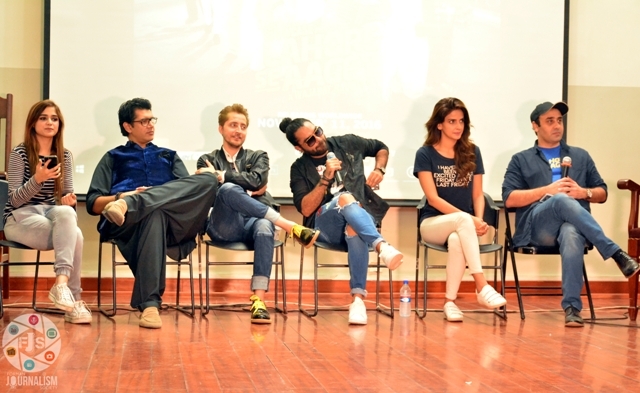 The cast of the film ‘Lahore Se Aagey,’ was invited to share their experiences in the media industry of Pakistan. Faculty members of FCCU joined the event and appreciated the continued efforts of team FJS. Team Lahore Se Aagey were asked multiple questions by the hosts and the audience. FMS and Marlbro’s gave a musical and a dance performance respectively, on the event in the honor of the guests. The event was conducted by the joint efforts of team FJS and guidance of their advisor Mr Syed M. Saqib Saleem. In the end, the guests were given souvenirs and were served refreshments.